Welcome to PropertECO; we are industry leaders of radon gas in Devon and are here to help you with any radon concerns you have. We have been providing the highest quality of radon gas inspection, radon gas mitigation surveys, radon gas advice and radon gas support across Devon for many years. 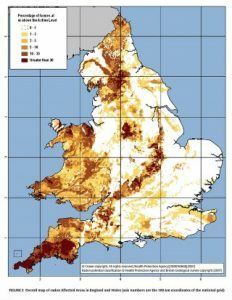 Elevated levels of radon have been found in areas of Devon. If you live in, or own, property in these areas it is highly recommend that you carry out a radon gas test to check the radon levels in your property. Radon is a naturally occurring radioactive gas that comes from the ground and is frequently found in properties located in Devon. Radon is an invisible and odourless gas. The only way to find if radon gas is present in your property is by using special radon detectors and radon test kits. We can supply you with relatively low cost, yet highly effective radon gas test kits. These can be used in your home or office, in areas that people spend the most of their time within the property. We can supply you with packs of three month radon gas detectors or ten day radon gas screening detectors. The three month test kit gives an accurate reading of the radon level within the property taking into account any fluctuations due to temperature. The ten day screening detectors are extremely useful for property owners looking to sell their property or buy a property as it give an accurate snap shot of radon levels in the home. After the period of radon gas testing the passive detectors are sent off to an independent laboratory where the results are checked and recommendations can then be made to lower the radon gas levels in your property, if required. For a standard house a kit of two radon detectors will be required. One will be placed typically in the ground floor living room and the other in a first floor bedroom. If you would like to order a radon gas test kit or find out more about radon gas testing in Devon please contact us directly on 01392 963 203. Here at PropertECO we are official stockists of the Canary Digital Radon Monitor. This is a radon gas testing monitor that is battery operated. This radon gas testing monitor gives you both long and short term radon gas measurements within your property. Our team of specialists in Devon have a selection of digital radon monitors for use by professionals. Please view our range of digital radon monitors by clicking here, or contact us directly for more details. If high levels of radon gas are detected through these radon gas monitors we can design and install specialist radon mitigation systems such as positive pressure ventilation and radon sump systems. These systems will lower the concentration of radon gas in your property and help prevent future infiltration of the gas in the future. We have over 20 years experience of radon gas testing in Devon. When you choose to get a radon gas survey or radon gas mitigation services from us, you know you are in safe and experienced hands. As radon gas testing specialists, we would highly recommend that you arrange for a radon gas test to be completed on your property, especially if you are selling your property. In many cases homeowners have found that they have a radon bond of up to £2000.00 held back on the purchase of the property. This bond is pending a satisfactory radon gas test in the property. We advise that you have your radon gas testing completed now, especially if you are looking at selling your property now or in the future. If you can put your house on the market with proof that you have had it radon gas tested recently, and have put any necessary steps into place to lower the radon levels in the property this can be a positive selling point for your property, even adding value to your property. It is essential that radon gas testing in Devon takes place in very workplace, under health and safety legislation – Ionising Radiation Regulations 2017 (IRR17). The radon risk assessment includes radon gas testing in the workplace premises if it is located in an ‘affected area’. Radon gas testing is also required if the workplace premises has a basement. If you would like to know more about the employers responsibilities in regards to managing radon gas in the workplace then please see get in touch. We can help with advice on how to test for radon gas, what to do if high levels of radon gas are found and how to protect your employees from radon gas in the workplace. You will find the full details of the legal duties employers have regarding employees’ exposure to radon gas on the Health & Safety Executive website by clicking here. While you may not be able to see, smell or taste radon gas in your home, it can still be causing major issues and health risks. Lung cancer is reportedly associated to radon gas. When people smoke and have exposure to radon gas, the risk of developing lung cancer greatly increases. Statistics show that more deaths are attributed to cancer caused by radon gas inhalation, that asthma. Every year an average of 1100 people die from lung cancer that is directly related to exposure to radon gas in their own home or workplace. We would highly recommend you arrange radon gas testing for your property in Devon if you are concerned that radon gas may be present in your home.